We are having an actual spring this year--regular rain and cool nights. It's days like these that make me seek out something warm, hearty and comforting. Best to enjoy this dish before it gets too hot. 1. Heat margarine or oil in a saucepan over medium heat. Sauté onions for 5-7 minutes, until translucent. Add garlic and sauté for 1 minute. 2. Add the tarragon and the mushrooms with a pinch of salt. Sauté for 3-5 mins, or until the mushrooms begin to soften. Add tamari and cook for another 5 mins. The mushrooms should be soft. 3. Add flour and mix well. Cook for a minute or so, stirring constantly. 4. Stream in 1.5 cups of the stock, stirring constantly so that the sauce remains smooth. 6. 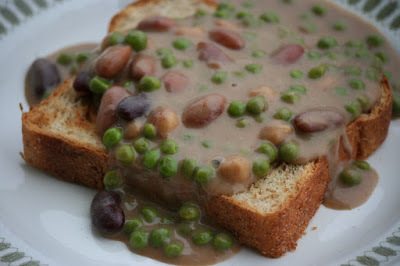 Return the blended mixture to the pan, add the remaining stock, the beans, and the peas. Bring to bubbling, stirring constantly. 7. Serve over thick slices of toasted hearty bread.